"Tokyo 2020" redirects here. For the Paralympics, see 2020 Summer Paralympics. It has been suggested that 2020 Summer Olympics marketing be merged into this article. (Discuss) Proposed since March 2019. Tokyo, Istanbul, and Madrid were the three candidate cities. The applicant cities of Baku (Azerbaijan) and Doha (Qatar) were not promoted to candidate status. A bid from Rome was withdrawn. The IOC voted to select the host city of the 2020 Summer Olympics on 7 September 2013 at the 125th IOC Session at the Buenos Aires Hilton in Buenos Aires, Argentina. An exhaustive ballot system was used. No city won over 50% of the votes in the first round, and Madrid and Istanbul were tied for second place. A run-off vote between these two cities was held to determine which would be eliminated. In the final vote, a head-to-head contest between Tokyo and Istanbul, Tokyo was selected by 60 votes to 36, as it got at least 49 votes needed for a majority. The Tokyo Big Sight Conference Tower will be used as the IBC-MPC Complex. The Tokyo Metropolitan Government set aside a fund of 400 billion Japanese yen (over 3.67 billion USD) to cover the cost of hosting the Games. The Japanese government is considering increasing slot capacity at both Haneda Airport and Narita International Airport by easing airspace restrictions. A new railway line is planned to link both airports through an expansion of Tokyo Station, cutting travel time from Tokyo Station to Haneda from 30 minutes to 18 minutes, and from Tokyo Station to Narita from 55 minutes to 36 minutes; the line would cost 400 billion yen and would be funded primarily by private investors. But East Japan Railway Company (East JR) is planning a new route near Tamachi to Haneda Airport. Funding is also planned to accelerate completion of the Central Circular Route, Tokyo Gaikan Expressway and Ken-Ō Expressway, and to refurbish other major expressways in the area. There are also plans to extend the Yurikamome automated transit line from its existing terminal at Toyosu Station to a new terminal at Kachidoki Station, passing the site of the Olympic Village, although the Yurikamome would still not have adequate capacity to serve major events in the Odaiba area on its own. The Organizing Committee is headed by former Prime Minister Yoshirō Mori. Olympic and Paralympic Minister Shun'ichi Suzuki is overseeing the preparations on behalf of the Japanese government. Twenty-eight of the thirty-three competition venues in Tokyo are within 8 kilometres (4.97 miles) of the Olympic Village. Eleven new venues are to be constructed. In September 2016, a review panel stated that the cost of hosting the Olympics and Paralympics could quadruple from the original estimate, and therefore proposed a major overhaul to the current plan to reduce costs, including moving venues outside Tokyo. In October 2018, the Board of Audit issued a report stating that the total cost of the venues could exceed US$25 billion. Seven venues for nine sports will be located within the central business area of Tokyo, northwest of the Olympic Village. Several of these venues were also used for the 1964 Summer Olympics. 13 venues for 15 sports will be located in the vicinity of Tokyo Bay, southeast of the Olympic Village, predominantly on Ariake, Odaiba and the surrounding artificial islands. Twelve venues for 16 sports will be situated farther than 8 kilometres (5 mi) from the Olympic Village. In December 2018, the Japanese government chose to ban drones from flying over venues being used for the Olympic and Paralympic Games. A ban was also imposed for the 2019 Rugby World Cup. Applications for volunteering at the 2020 Olympic and Paralympic Games were accepted from 26 September 2018. By 18 January 2019, a total of 204,680 applications had been received by the organising committee. Interviews to select the requisite number of volunteers began in February 2019 and training will take place in October 2019. The volunteers at the venues will be known as "Field Cast" and the volunteers in the city will be known as "City Cast"; these names were chosen from a shortlist of four from an original 149 pairs of names. The other shortlisted names were "Shining Blue" & "Shining Blue Tokyo", "Games Anchor" & "City Anchor", and "Games Force" & "City Force". The names were chosen by the people who had applied to be volunteers at the Games. In February 2017, the Tokyo Organizing Committee announced an electronics recycling program in partnership with Japan Environmental Sanitation Center and NTT docomo, soliciting donations of electronics (such as mobile phones) to be reclaimed as materials for the medals. Aiming to collect 8 tonnes of metals to produce the medals for the Olympic and Paralympic Games, collection boxes were deployed at public locations and NTT docomo retail shops that April. A design competition for the medals launched in December 2017. In May 2018, the organizing committee reported that they had obtained half the required 2,700 kilograms of bronze, but that they were struggling to obtain the required amount of silver: although silver and bronze medals purely utilize their respective materials, IOC requirements mandate that gold medals utilize silver as a base. The collection of bronze was completed in November 2018, with the remainder estimated to be complete by March 2019. Aluminium taken from temporary housing in Fukushima was used to make the torches for the Olympic Flame. More than 10,000 pieces of aluminium were used and organizers contacted local authorities to see which houses were no longer being used. The torch relay will arrive in Japan and begin its journey across the country at Fukushima on 26 March 2020. The relay's slogan is "Hope lights our way" and is sponsored by Coca-Cola, Toyota, NTT and Nippon Life. 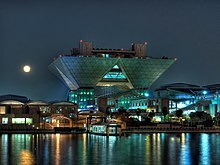 In December 2018, it was announced that cauldrons would be placed in the Olympic Stadium and on the waterfront near the Yume-no-Ohashi bridge. After the opening ceremony the flame would be transferred to the waterfront, with the stadium cauldron extinguished until the closing ceremony; with organizers stating that it was difficult to keep the cauldron in the stadium. The torch and the torch relay logo was unveiled on 19 March 2019, the torch is based on an idea of a Japanese cherry blossom sakura flower in gold and sakura color, made from recycled aluminium shaped using the same process as used to create bullet trains. The torch was designed by Tokujin Yoshioka. The torch relay logo was unveiled the same day, The three rectangular shapes that make up the Tokyo 2020 Games emblems have been redesigned to resemble the flame of a torch, and express the dynamic movement of a flame. The design also incorporates the fuki bokashi technique for colour gradation often used in traditional Japanese ukiyoe painting to further imbue the emblem with a Japanese aesthetic. The opening ceremony tickets will range from 12,000 to 300,000 yen, with a maximum price of 130,000 yen for the finals of athletics. The average price of all the Olympic tickets is 7,700 yen. 50% of the tickets will be sold for 8,000 yen or less. A symbolic ticket price of 2,020 yen will be for families, groups resident in Japan and in conjunction with a school programme. Tickets will be sold through 40,000 shops in Japan and by mail order to Japanese addresses through the Internet. International guests will need to visit Japan during the sales period or arrange for tickets through a third party, such as a travel agent. The official programme for the 2020 Summer Olympics was approved by the IOC executive board on 9 June 2017. The president of the IOC, Thomas Bach, stated that the goal for the Tokyo Games was to make them more "youthful" and "urban", and to increase the number of female participants. The games will feature 339 events in 33 different sports, encompassing 50 disciplines. Alongside the five new sports that will be introduced in Tokyo, there will be fifteen new events within existing sports, including 3-on-3 basketball, freestyle BMX and Madison cycling, and new mixed events in several sports. As part of a goal to control costs and ensure that the Olympics remain "relevant to sports fans of all generations", the IOC assessed the 26 sports contested at the 2012 Olympics, with the remit of dropping one sport and thus retaining 25 "core" sports to join new entrants golf and rugby sevens at the 2020 Games. This move would bring the total number of sports to 27, one less than the requirement of 28 for the 2020 Olympics programme, thus leaving a single vacancy which the IOC would seek to fill from a shortlist containing seven unrepresented sports as well as the sport that had been dropped from the 2012 Olympics programme. On 12 February 2013, IOC leaders voted to drop wrestling from the "core" programme for the 2020 Games; this was a surprising decision considering that wrestling is one of the oldest Olympic sports, having been included since the ancient Olympic Games and included in the original programme for the modern Games. The New York Times felt that the decision was based on the shortage of well-known talent and the absence of women's events in the sport. Wrestling was duly added to the shortlist of applicants for inclusion in the 2020 Games, alongside the seven new sports that were put forward for consideration. On 29 May 2013, it was announced that three sports had made the final shortlist: baseball/softball, squash and wrestling. The other five sports were excluded from consideration at this point: karate, roller sports, sport climbing, wakeboarding, and wushu. On 8 September 2013, at the 125th IOC Session, the IOC selected wrestling to be included in the Olympic programme for 2020 and 2024. Wrestling secured 49 votes, while baseball/softball and squash received 24 votes and 22 votes respectively. Under new IOC policies that shift the Games to an "event-based" programme rather than sport-based, the host organizing committee can now also propose the addition of sports to the programme. This rule is designed so that sports popular in the host country can be added to the programme to improve local interest. As a result of these changes, a new shortlist of eight sports was unveiled on 22 June 2015, consisting of baseball/softball, bowling, karate, roller sports, sport climbing, squash, surfing, and wushu. On 28 September 2015, organisers submitted their shortlist of five proposed sports to the IOC: baseball/softball, karate, sport climbing, surfing, and skateboarding. The five proposed sports were approved on 3 August 2016 by the IOC during the 129th IOC Session in Rio de Janeiro, Brazil, and will be included in the sports programme for 2020 only, bringing the total number of sports at the 2020 Olympics to 33. There will be test events before the Olympic and Paralympic Games they will be contested from June 2019 to June 2020 before the start of the 2020 Summer Olympics. Several of the events are existing championships but some will be created to serve as test events It was announced in February 2019 that test events would be under the banner "Ready, Steady, Tokyo." 22 of the 56 events would be organised by the Tokyo organising committee and the rest by national and international organisations. World Sailing’s World Cup Series held at Enoshima was the first test event, with last one set to be the Tokyo Challenge Track Meet in May 2020. The 2020 schedule by session was approved by the IOC Executive Board on 18 July 2018, with the exception of swimming, diving, and synchronized swimming. A more detailed schedule by event has been released on 16 April 2019, still omitting a detailed schedule for the boxing events. Per the historical precedent of swimming at the 2008 Summer Olympics in Beijing and figure skating at the 2018 Winter Olympics in Pyeongchang, swimming finals will be held in the morning to allow live primetime broadcasts in the Americas (due to the substantial fees NBC has paid for rights to the Olympics, the IOC has allowed NBC to have influence on event scheduling to maximize U.S. television ratings when possible; NBC agreed to a $7.75 billion contract extension on 7 May 2014, to air the Olympics through the 2032 games, is also one of the major sources of revenue for the IOC). Japanese broadcasters were said to have criticized the decision, as swimming is one of the most popular Olympic events in the country. In January 2016, the second part of a World Anti-Doping Agency commission report into corruption included a footnote detailing a conversation between Khalil Diack, son of former International Association of Athletics Federations (IAAF) president Lamine Diack, and Turkish officials heading up the Istanbul bid team. A transcript of the conversation cited in the report suggested that a "sponsorship" payment of between US$4 million and 5 million had been made by the Japanese bid team "either to the Diamond League or IAAF". The footnote claimed that because Istanbul did not make such a payment, the bid lost the support of Lamine Diack. The WADA declined to investigate the claims because it was, according to its independent commission, outside the agency's remit. In July and October 2013 (prior to and after being awarded the Games), Tokyo made two bank payments totalling SG$2.8 million to a Singapore-based company known as Black Tidings. The company is tied to Papa Massata Diack, a son of Lamine Diack who worked as a marketing consultant for the IAAF, and is being pursued by French authorities under allegations of bribery, corruption, and money laundering. Black Tidings is held by Ian Tan Tong Han, a consultant to Athletics Management and Services—which manages the IAAF's commercial rights, and has business relationships with Japanese firm Dentsu. Black Tidings has also been connected to a doping scandal involving the Russian athletics team. Japanese Olympic Committee and Tokyo 2020 board member Tsunekazu Takeda stated that the payments were for consulting services, but refused to discuss the matter further because it was confidential. Toshiaki Endo called on Takeda to publicly discuss the matter. Massata denied that he had received any money from Tokyo's organizing committee. The IOC established a team to investigate these matters, and will closely follow the French investigation. In January 2019, a source revealed that Takeda was being formally investigated over alleged corruption. On 19 March 2019, Takeda resigned from the JOC. The original logos of the 2020 Summer Olympics (top left) and Paralympics (top right) and the logo of the Théâtre de Liège (bottom). The initial design for the official emblems of the 2020 Summer Olympics and Paralympics were unveiled on 24 July 2015. The logo resembled a stylized "T": a red circle in the top-right corner representing a beating heart, the flag of Japan, and an "inclusive world in which everyone accepts each other"; and a dark grey column in the centre representing diversity. The Paralympic emblem was an inverted version of the pattern made to resemble an equal sign. Shortly after the unveiling, Belgian graphics designer Olivier Debie accused the organizing committee of plagiarizing a logo he had designed for the Théâtre de Liège, which aside from the circle, consisted of nearly identical shapes. Tokyo's organizing committee denied that the emblem design was plagiarized, arguing that the design had gone through "long, extensive and international" intellectual property examinations before it was cleared for use. Debie filed a lawsuit against the IOC to prevent use of the infringing logo. The emblem's designer, Kenjirō Sano, defended the design, stating that he had never seen the Liège logo, while TOCOG released an early sketch of the design that emphasized a stylized "T" and did not resemble the Liège logo. However, Sano was found to have had a history of plagiarism, with others alleging his early design plagiarized work of Jan Tschichold, that he used a photo without permission in promotional materials for the emblem, along with other past cases. On 1 September 2015, following an emergency meeting of TOCOG, Governor of Tokyo Yōichi Masuzoe announced that they had decided to scrap Sano's two logos. The committee met on 2 September 2015 to decide how to approach another new logo design. On 24 November 2015, an Emblems Selection Committee was established to organize an open call for design proposals, open to Japanese residents over the age of 18, with a deadline set for 7 December 2015. The winner would receive ¥1 million and tickets to the opening ceremonies of both the 2020 Summer Olympics and Paralympics. On 8 April 2016, a new shortlist of four pairs of designs for the Olympics and Paralympics were unveiled by the Emblems Selection Committee; the Committee's selection—with influence from a public poll—was presented to TOCOG on 25 April 2016 for final approval. The new emblems for the 2020 Olympics and Paralympics were unveiled on 25 April 2016; designed by Asao Tokolo, who won a nationwide design contest, the emblem takes the form of a ring in an indigo-coloured checkerboard pattern. The design is meant to "express a refined elegance and sophistication that exemplifies Japan". Sony and Panasonic are partnering with NHK to develop broadcasting standards for 8K resolution television, with a goal to release 8K television sets in time for the 2020 Olympics. Italian broadcaster RAI announced an intent to deploy 8K broadcasting for the Games. In the United States, the 2020 Summer Olympics will be broadcast by NBCUniversal properties, as part of a US$4.38 billion agreement that began at the 2014 Winter Olympics in Sochi. In Europe, this will be the first Summer Olympics under the IOC's exclusive pan-European rights deal with Eurosport, which began at the 2018 Winter Olympics and run through 2024. The rights for the 2020 Games cover almost all of Europe, excluding France due to an existing rights deal that will expire following these Games in favour of Eurosport, and Russia due to a pre-existing deal with a marketer through 2024. Eurosport will sub-license coverage to free-to-air networks in each territory and other Discovery Inc.-owned channels. In the United Kingdom, these will be the last Games whose rights are primarily owned by the BBC, although as a condition of a sub-licensing agreement that will carry into the 2022 and 2024 Games, Eurosport holds exclusive pay television rights. Telecom company NTT Docomo signed a deal with Finland's Nokia to provide 5G-ready baseband networks in Japan in time for the Olympics. ^ While ashita literally means 'tomorrow', it is intentionally spelled as mirai 'future'. ^ "国際スローガン "Discover Tomorrow" 並びにルックプログラムを発表" [Tokyo Extends an Invitation to "Discover Tomorrow" through 2020 Bid Campaign]. The Tokyo Organising Committee of the Olympic and Paralympic Games (in Japanese). 19 July 2012. Retrieved 23 February 2019. ^ "Olympics 2020: Tokyo wins race to host Games". BBC Sport. 7 September 2013. Archived from the original on 7 June 2015. Retrieved 13 February 2018. ^ Wilson, Stephen (8 September 2013). "Results of the IOC vote to host the 2020 Summer Olympics". Austin American-Statesman. Associated Press. Retrieved 11 December 2018. ^ "羽田・成田発着を拡大、五輪へインフラ整備急ぐ". 日本経済新聞. 10 September 2013. Archived from the original on 11 September 2013. Retrieved 10 September 2013. ^ "五輪で東京に1000万人　過密都市ゆえの課題多く". 日本経済新聞. 10 September 2013. Archived from the original on 11 September 2013. Retrieved 10 September 2013. ^ PST (24 January 2014). "Mori heads Tokyo 2020 organizing committee". Sports.yahoo.com. Archived from the original on 8 February 2014. Retrieved 4 February 2014. ^ "List of Ministers (The Cabinet) | Prime Minister of Japan and His Cabinet". japan.kantei.go.jp. Archived from the original on 29 September 2018. Retrieved 5 October 2018. ^ Himmer, Alastair (5 February 2012). "Rugby-Tokyo stadium set for billion dollar facelift". Reuters. Archived from the original on 18 September 2017. Retrieved 17 September 2017. ^ "Notice". Archived from the original on 19 April 2013. ^ Himmer, Alastair (17 July 2015). "Japan rips up 2020 Olympic stadium plans to start anew". news.yahoo.com. AFP. Archived from the original on 21 July 2015. Retrieved 17 July 2015. ^ "Tokyo 2020 candidature file – section 8 – Sports and Venues" (PDF). Tokyo 2020. Archived from the original (PDF) on 5 April 2013. Retrieved 10 September 2013. ^ "Tokyo panel: Olympic cost could expand fourfold". NHK. 29 September 2016. Archived from the original on 1 October 2016. Retrieved 30 September 2016. ^ "Tokyo 2020 costs skyrocket to US$25 billion". Retrieved 4 November 2018. ^ "Seaside Park Hockey Stadium". Bureau of Olympic and Paralympic Games Tokyo 2020 Preparation. Archived from the original on 28 July 2018. Retrieved 17 September 2018. ^ Originally to be held at Water Polo Arena in Koto, Tokyo; venue moved in June 2015. "東京五輪、26競技の会場決定　自転車・サッカー除き". Nihon Keizai Shimbun. 9 June 2015. Archived from the original on 10 June 2015. Retrieved 9 June 2015. ^ "Dream Island Archery Field". Bureau of Olympic and Paralympic Games Tokyo 2020 Preparation. Archived from the original on 28 July 2018. Retrieved 17 September 2018. ^ Badminton originally to be held at Youth Plaza Arena; venue moved in June 2015. "東京五輪、26競技の会場決定　自転車・サッカー除き". Nihon Keizai Shimbun. 9 June 2015. Archived from the original on 10 June 2015. Retrieved 9 June 2015. ^ Rugby sevens originally to be held at National Olympic Stadium; venue moved in June 2015. "東京五輪、26競技の会場決定　自転車・サッカー除き". Nihon Keizai Shimbun. 9 June 2015. Archived from the original on 10 June 2015. Retrieved 9 June 2015. ^ Originally to be held at Youth Plaza Arena; proposal for venue change to Saitama Super Arena in late 2014 was confirmed in March 2015 by the IOC. "IOC supports Tokyo's plans to relocate Olympic venues". The Japan Times. 19 November 2014. Archived from the original on 11 June 2015. Retrieved 10 June 2015. "Moving 2020 hoops to Saitama latest blow for game". The Japan Times. 3 March 2015. Archived from the original on 11 June 2015. Retrieved 10 June 2015. ^ Originally to be held at Wakasu Olympic Marina; venue moved in June 2015. "東京五輪、26競技の会場決定　自転車・サッカー除き". Nihon Keizai Shimbun. 9 June 2015. Archived from the original on 10 June 2015. Retrieved 9 June 2015. ^ All three events originally to be held at Tokyo Big Sight; venue moved in June 2015. "東京五輪、26競技の会場決定　自転車・サッカー除き". Nihon Keizai Shimbun. 9 June 2015. Archived from the original on 10 June 2015. Retrieved 9 June 2015. ^ "Change to Tokyo 2020 equestrian venue approved". inside.fei.org. 28 February 2015. Archived from the original on 22 August 2016. Retrieved 16 August 2016. ^ Beall, Joel (20 March 2017). "2020 Olympic golf course changes policy, allows women full membership". Archived from the original on 2 October 2017. Retrieved 1 October 2017. ^ Wilson, Stephen (10 December 2015). "IOC approves switch of cycling venues for Tokyo Olympics". japantoday.com. Archived from the original on 10 December 2015. Retrieved 10 December 2015. ^ "IOC approves switch of cycling venues for Tokyo Olympics". japantimes.co.jp. 9 December 2015. Archived from the original on 21 July 2016. Retrieved 16 August 2016. ^ "Fukushima Prefecture to Host Tokyo 2020 Baseball & Softball Matches, Showcasing the Power of Sport to Support Recovery｜The Tokyo Organising Committee of the Olympic and Paralympic Games". The Tokyo Organising Committee of the Olympic and Paralympic Games. Archived from the original on 31 March 2017. Retrieved 30 March 2017. ^ "Olympic sport football". tokyo2020.jp. 21 November 2016. Archived from the original on 21 November 2016. Retrieved 21 November 2016. ^ "More than 200,000 Applications Received for Tokyo 2020 Volunteer Programme". Tokyo 2020. Retrieved 1 February 2019. ^ "Tokyo 2020: 180,000 apply to be volunteers". IPC. ^ "Volunteer names unveiled for Tokyo 2020". IOC. 30 January 2019. ^ Palmer, Dan (1 February 2017). "Tokyo 2020 urge public to help create recycled medals". Inside the Games. Retrieved 10 February 2019. ^ "Project to recycle old mobile phones for Olympic medals gets off to slow start". The Japan Times. 2 January 2018. ISSN 0447-5763. Archived from the original on 4 November 2018. Retrieved 4 November 2018. ^ Etchells, Daniel (22 December 2017). "Tokyo 2020 launches Olympic and Paralympic medal design competition". Inside the Games. Retrieved 10 February 2019. ^ "Japan struggles for silver for Tokyo 2020 medals". Inside the Games. Retrieved 10 February 2019. ^ Pavitt, Michael (25 November 2018). "Bach donates to project recycling metals for Tokyo 2020 medals". Inside the Games. Retrieved 10 February 2019. ^ Gillen, Nancy (4 January 2019). "Recycled aluminium from temporary housing in Fukushima to be used for Tokyo 2020 Olympic Torches". inside the games. ^ Palmer, Dan (30 November 2018). "Toyota become presenting partner of Tokyo 2020 Torch Relay". inside the game. ^ Palmer, Dan (10 April 2018). "Tokyo 2020 unveil "Hope Lights Our Way" slogan for Torch Relay". inside the games. ^ Rowbottom, Mike (18 December 2018). "Tokyo 2020 confirms it will use Olympic flame cauldrons in stadium and on the waterfront". inside the games. ^ "Tickets for Olympic Games / Tokyo Olympic Japan 2020". Archived from the original on 31 August 2016. Retrieved 30 August 2016. ^ "How To Buy Tokyo Olympic Tickets". TrulyTokyo. Archived from the original on 3 May 2018. Retrieved 3 May 2018. ^ "3-on-3 basketball officially added to Tokyo Olympics". CBC Sports. Archived from the original on 10 June 2017. Retrieved 9 June 2017. ^ "Tokyo 2020: Mixed-gender events added to Olympic Games". BBC Sport. Archived from the original on 10 June 2017. Retrieved 9 June 2017. ^ Hamilton, Tracee (8 September 2013). "Wrestling, IOC make right moves in getting sport back on 2020 Olympics program". Washington Post. ISSN 0190-8286. Archived from the original on 21 June 2018. Retrieved 16 March 2018. ^ Longman, Jeré (12 February 2013). "Olympics Moves to Drop Wrestling in 2020". The New York Times. ISSN 0362-4331. Archived from the original on 21 June 2018. Retrieved 16 March 2018. ^ "Wrestling to be dropped from 2020 Olympic Games". BBC Sport. Archived from the original on 1 July 2015. Retrieved 26 May 2018. ^ "Wrestling, baseball/softball and squash shortlisted by IOC for 2020 as five fail to make cut". Archived from the original on 24 September 2015. Retrieved 12 August 2015. ^ "Wrestling added to Olympic programme for 2020 and 2024 Games". IOC. 8 September 2013. Archived from the original on 11 September 2013. Retrieved 8 September 2013. ^ "Olympic Agenda 2020 Recommendations" (PDF). IOC. Archived (PDF) from the original on 10 August 2015. Retrieved 23 June 2015. ^ "Baseball, softball among 8 sports proposed for 2020 Games". ESPN.com. Archived from the original on 7 September 2015. Retrieved 12 August 2015. ^ "Olympics: Skateboarding & surfing among possible Tokyo 2020 sports". BBC Sport. Archived from the original on 22 April 2016. Retrieved 29 March 2016. ^ "IOC approves five new sports for Olympic Games Tokyo 2020". Olympic.org. 3 August 2016. Archived from the original on 7 October 2016. Retrieved 3 August 2016. ^ "You're in! Baseball/softball, 4 other sports make Tokyo cut". USA Today. 3 August 2016. Archived from the original on 16 October 2017. Retrieved 18 August 2016. ^ "Tokyo 2020 Test Events". Tokyo 2020. 3 January 2019. ^ "Tokyo 2020: Test event schedule announced". www.paralympic.org. 2 October 2018. ^ "Fewer Russians Could Be a Windfall for U.S. Olympic Business". The New York Times. 7 December 2017. Retrieved 5 February 2018. ^ "FINA back holding swimming finals in morning at Tokyo 2020 Olympics". Inside the Games. Archived from the original on 25 July 2018. Retrieved 25 July 2018. ^ "Tokyo 2020 swimming finals set for prime-time in United States as agreement reached to hold morning medal races". Inside the Games. Archived from the original on 24 September 2018. Retrieved 24 September 2018. ^ a b c "Tokyo Olympics 2020: French prosecutors probe '$2m payment'". BBC News. 12 May 2016. Archived from the original on 13 May 2016. Retrieved 14 May 2016. ^ a b c "Tokyo Olympics: Japan to 'fully cooperate' with suspicious payments inquiry". The Guardian. Archived from the original on 4 June 2016. Retrieved 7 June 2016. ^ "Life bans for three athletics figures over alleged doping cover-up". BBC Sport. Archived from the original on 9 April 2016. Retrieved 7 June 2016. ^ a b "Tokyo 2020 Olympic bid leader refuses to reveal Black Tidings details". The Guardian. Archived from the original on 4 June 2016. Retrieved 6 June 2016. ^ "IOC concerned at suspect payments made by Tokyo 2020 bid team". The Guardian. Archived from the original on 6 June 2016. Retrieved 7 June 2016. ^ "Tokyo 2020 Games: Japan Olympics chief 'investigated in French corruption probe'". 11 January 2019. ^ Wharton, David. "Embattled head of Japan's Olympic committee resigns ahead of 2020 Summer Games". Los Angeles Times. Retrieved 19 March 2019. ^ "Tokyo 2020 unveils official emblem with five years to go". Olympic.org. Archived from the original on 10 August 2015. Retrieved 27 July 2015. ^ "Tokyo 2020 launches emblems for the Olympic and Paralympic Games". IPC. Archived from the original on 27 July 2015. Retrieved 28 July 2015. ^ "Tokyo Olympic Games logo embroiled in plagiarism row". The Guardian. 30 July 2015. Archived from the original on 3 August 2015. Retrieved 1 August 2015. ^ "Tokyo Olympics emblem said to look similar to Belgian theater logo". The Japan Times. 30 July 2015. Archived from the original on 31 July 2015. Retrieved 30 July 2015. ^ a b c "Tokyo 2020 Olympics logo scrapped after allegations of plagiarism". The Guardian. Archived from the original on 2 September 2015. Retrieved 1 September 2015. ^ "Tokyo 2020 Emblems Committee relax competition rules ahead of search for new logo". InsideTheGames.biz. Archived from the original on 10 October 2015. Retrieved 26 October 2015. ^ a b "Japan unveils final four candidates for Tokyo 2020 Olympics logo". Japan Times. 8 April 2016. Archived from the original on 11 April 2016. Retrieved 11 April 2016. ^ "Tokyo Games organizers decide to scrap Sano emblem". NHK World. 1 September 2015. Archived from the original on 4 September 2015. Retrieved 1 September 2015. ^ "Checkered pattern by artist Tokolo chosen as logo for 2020 Tokyo Olympics". Japan Times. Archived from the original on 25 April 2016. Retrieved 25 April 2016. ^ Vincent, James (26 August 2016). "Sony and Panasonic target 8K TVs for 2020 Olympics". The Verge. Archived from the original on 15 September 2017. Retrieved 21 July 2017. ^ "Exclusive: Lost market share prompts Sony-Panasonic TV tech alliance". Nikkei Asian Review. Archived from the original on 29 April 2017. Retrieved 21 July 2017. ^ Strauss, Will. "Italy's Rai to start 8K broadcasts in time for 2020 Tokyo Olympics". SVG Europe. Retrieved 8 March 2019. ^ McCarthy, Michael (7 June 2011). "NBC wins U.S. TV rights to four Olympic Games through 2020". USA Today. Archived from the original on 5 February 2013. Retrieved 7 June 2011. ^ "Russian state broadcasters commit to PyeongChang coverage". Archived from the original on 7 February 2018. Retrieved 6 February 2018. ^ "Olympics coverage to remain on BBC after Discovery deal". The Guardian. Archived from the original on 12 August 2016. Retrieved 7 June 2016. ^ "BBC dealt another blow after losing control of TV rights for Olympics". The Guardian. Archived from the original on 3 July 2015. Retrieved 30 June 2015. ^ "Nokia, NTT DoCoMo prepare for 5G ahead of Tokyo Olympics launch". 2 March 2015. Archived from the original on 21 January 2018. Retrieved 20 January 2018 – via Reuters. ^ "Nokia wins 5G business with Japan's NTT DoCoMo - FierceWireless". www.fiercewireless.com. Archived from the original on 21 January 2018. Retrieved 20 January 2018. Wikimedia Commons has media related to 2020 Summer Olympics. Wikivoyage has a travel guide for Tokyo Olympic and Paralympic Games 2020.